1. Bought a balsam fir wreath for the front of our house. These wreaths are hanging outside most of our local quick-stop stores, so our wreath was easy to find. 2. Bought a Christmas turkey. I am not much for preparing meat for the stove, so we bought a ready-stuffed Butterball turkey. I will still have to cope with the ‘gizzard’ bag but mostly I can just peel off the plastic, put the bird into the pan and shove it in the oven. What a wimp I am! 3. Visited the Atlantic Super Store and got a sampling of their fancy hors-d’oeuvres. Coconut shrimp! A treat for a cold winter evening. 4. Drove to our camp and gathered cedar boughs to make a Christmas garland. We sat in the camp, ate Clementine oranges and talked for an hour or so. We even heard the loons on the lake call three times. A very pleasant way to prepare for Christmas. What small things do you do to get ready for the Christmas season? I have completed one of the paintings I am preparing for my fall sale of books and paintings. 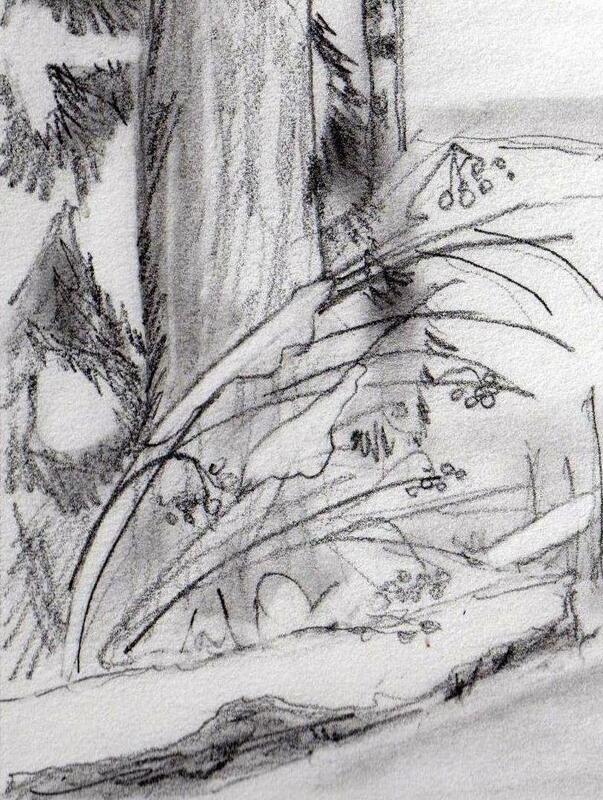 This painting is of the wild strawberries growing at our cabin property. I hope when you see these paintings, they will remind you of the berry-picking seasons to come! Like miniature fireworks, bright bunches of the berries of Highbush Cranberry (Viburnum trilobum Marsh.) burst along our roadsides in late summer. 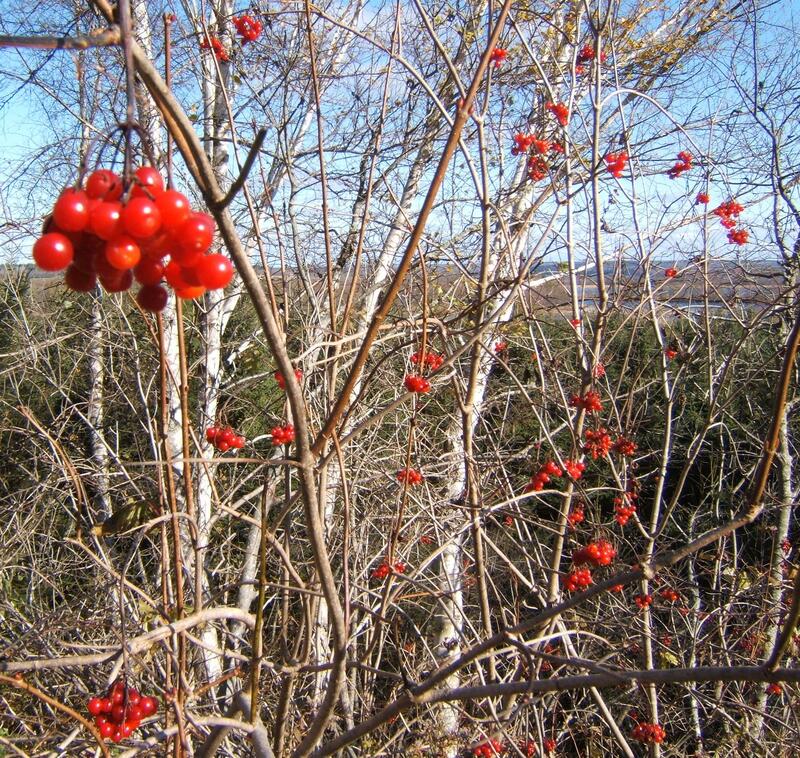 Highbush Cranberry is also called Cranberry, Pimbina, and in Quebec, quatres-saisons des bois. 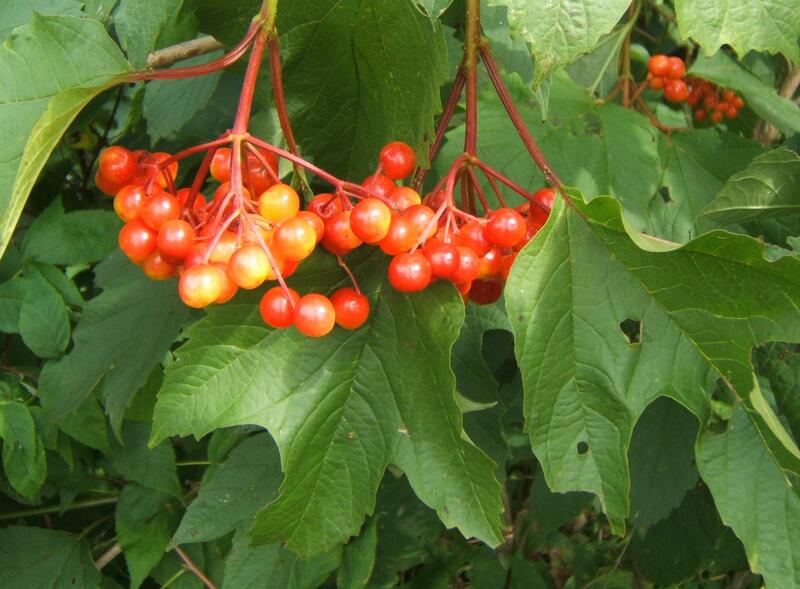 The Highbush Cranberry is a large deciduous shrub, found in cool woods, thickets, shores and slopes. It has grey bark and dense reddish-brown twigs. The large lobed leaves are very similar to red maple. In spring and summer, the white flowers bloom in a cyme or corymb (a flat-topped or convex open flower-cluster). Most flowers in the cluster are small, but the outermost flowers are large and showy, making the plant attractive for insect pollinators. The fruit is a drupe, ellipsoid and brightly colored red or orange. The juicy, acidic fruit has a very similar flavour to cranberry (Vaccinium spp. L.) and is used for jams and jellies. The preserves are rich in Vitamin C.